The Low-Down: Amazon Is Worth $1 Trillion. Will Governments, Consumers and Competitors Unite To Limit Its Power? Amazon Is Worth $1 Trillion. Will Governments, Consumers and Competitors Unite To Limit Its Power? Everyone loves to hate Amazon, even as they become more dependent on it. It may be the only enterprise which can unite Bernie Sanders and Donald Trump. The only certainty on the path to the next trillion is a bigger spotlight on Amazon’s growing power, both internally as it pertains to its treatment of its workers and externally as the politicization of all things Amazon — from Senator Bernie Sanders on the left to President Donald Trump on the right — is recasting Amazon narratives into black and white. 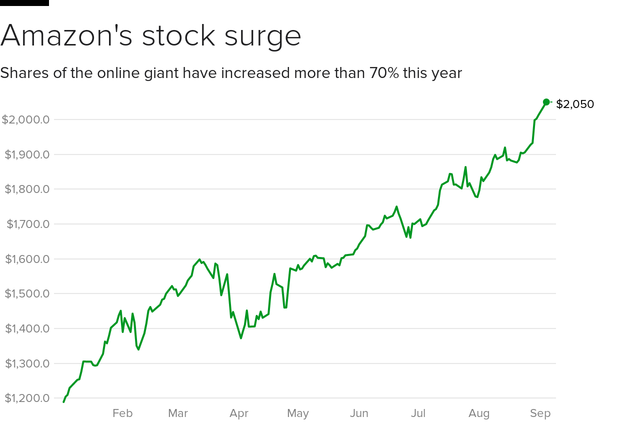 On Tuesday, Amazon became the second publicly traded U.S. company to hit the $1 trillion market cap milestone, coming just a month after Apple became the first. The company’s 24-year journey has included a market-cap sprint over the last year fueled by the mainstreamification of Amazon Prime; the rapid expansion of its seller base and product catalogue; and the bonus profit cushions generated by fast-growing units like Amazon Web Services and the Amazon advertising business. But the only certainty on the path to the next trillion is a bigger spotlight on Amazon’s growing power, both internally as it pertains to its treatment of its warehouse workers and externally related to how its dominance impacts the rest of the retail industry, its partners like the United States Postal Service, as well as the cities that it calls home. These are all gray-area topics deserving of nuanced discussions. But the politicization of all things Amazon — from Senator Bernie Sanders on the left to President Donald Trump on the right — is recasting Amazon narratives into black and white. That’s not going to change anytime soon, with the midterm elections on the docket for the fall and the 2020 presidential campaign cycle to follow. So buckle up, Amazon policy department. A trillion is only a start.